You know that feeling when you’re under severe stress—your heart begins to race and your mouth gets dry? Well, animals experience their own forms of that, too. And researchers are worried about how narwhals, the so-called unicorns of the sea, will deal with the stress that’ll accompany the loss of sea ice in their habitats. According to one new study, probably not well. The fact that climate change is melting Arctic sea ice is no secret. The extent of sea ice throughout the Arctic Ocean, where the narwhals call home, is dramatically diminishing, according to the National Snow and Ice Data Center. The average sea ice extent year round between 1981 and 2010 was roughly 1 million square kilometers larger than it was this year. With less ice around, more ships will enter Arctic waters. Already, in waters along the Milne Inlet in Canada, shipping traffic just about tripled between 2015 and 2016. This analysis found narwhals swam faster when a large vessel approached. Now, a new study has found narwhal heart rates decrease when they’re stressed. That’s bad news if they’re fleeing stressful situations, like a huge loud ship approaching. The study, published in Science Thursday, shows that narwhal heart rate appears to hit a major freeze as the animal flees from danger. That’s dangerous for the cetacean, because its muscles need more oxygen when working to help the animal run away quickly. With their hearts beating as slowly as three beats per minute, narwhals aren’t receiving enough oxygen to make up for the speed. “That doesn’t make any sense,” Greg Breed, an ecologist at the University of Alaska in Fairbanks who wasn’t involved with the study told Science Magazine. The research team discovered this by using an attachable device that monitors heart rates on nine narwhals in 2014 and 2015, after releasing them from nets they got entangled in during indigenous hunts. Terrie Williams, an ecophysiologist from the University of California, Santa Cruz, had developed this technology while researching dolphins. It worked for narwhals, too, but would fall off after three days max. Still, in the short time the devices were attached, the researchers noticed something funny about the narwhals’ escape response. They got stressed and sped away, but, as mentioned above, their bodies didn’t respond in a way to accommodate their increased speed. Their hearts slowed down. 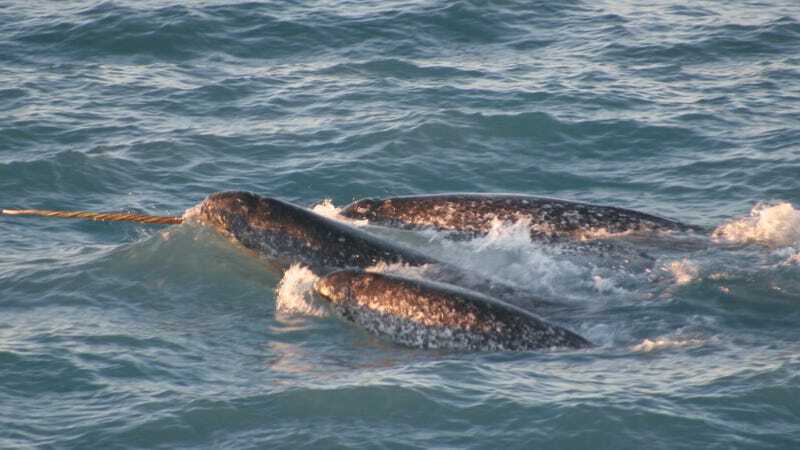 The team still doesn’t know how the narwhals will respond to the particular stress of increased sea traffic and noise as their historically secluded homes become marine highways, or what chronic stress can do to the extraordinary animal long term. Other creatures—like lab mice, and even humans—have been found to experience cardiac arrest due to chronic stress. With about 175,000 narwhals estimated to exist worldwide, let’s hope they’re better at handling stress than we are.